Not all game data could be loaded. 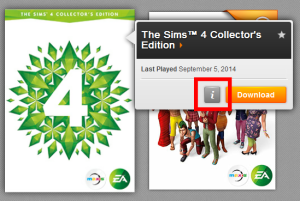 The save game references neighborhoods that have been uninstalled or otherwise are no longer available. If you continue, you will encounter missing data and may have unexpected results. 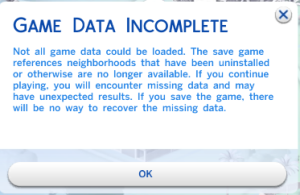 If you save the game, there will be no way to recover the missing data. 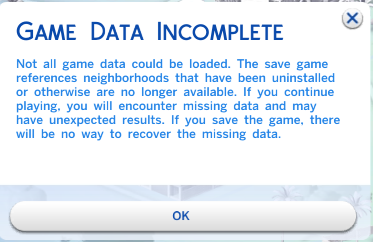 This message usually occurs if the data from an expansion or game pack is no longer present in the game, mostly when you uninstall the packs and try to play a save game that was saved with those expansions. Close the game and do not save it. 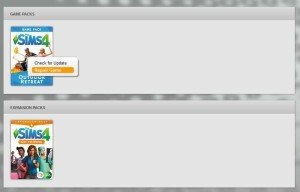 Start your game from your most recent pack (click on i on the base game and scroll down for the game packs. Then click on PLAY on the most recent one. Only delete your cache files when needed (aka when you have an issue or remove mods). It’s not needed to delete them every time.